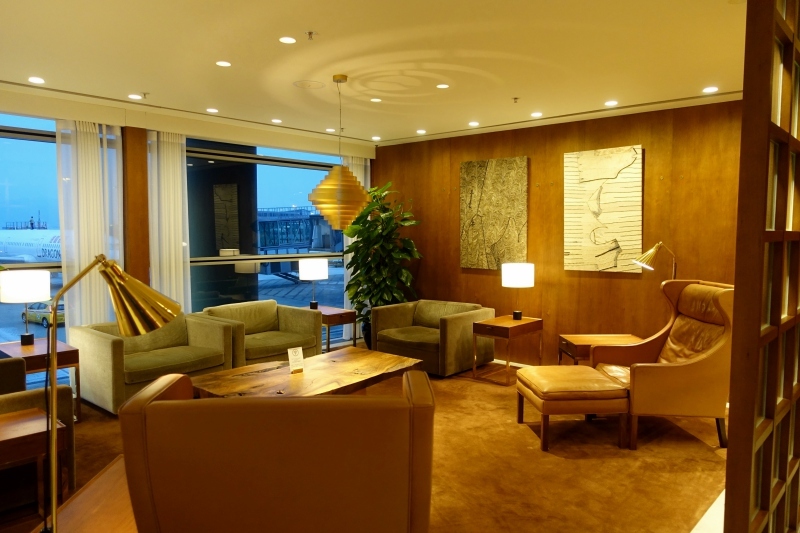 This Cathay Pacific The Pier First Class Lounge HKG Review is from a recent Cathay Pacific First Class trip, including stays at luxury hotels in Hong Kong and Vietnam. Visting Hong Kong? See all our posts tagged Hong Kong. 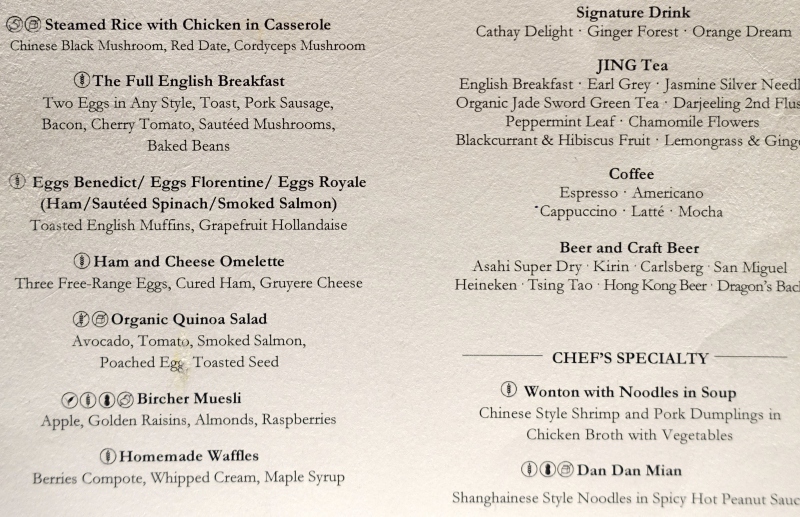 You do receive access even if you arrived in Cathay Pacific First Class but are departing on a Cathay Pacific business class flight later that day. 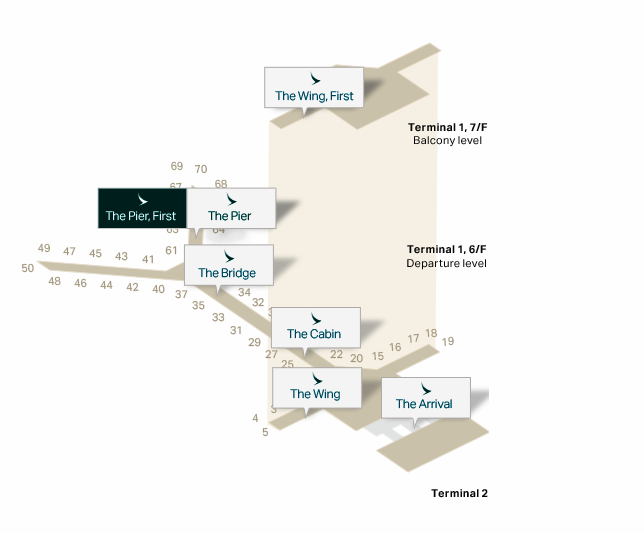 Ideally, keep your Cathay first class boarding pass, but even if you misplace it, as I did, The Pier (or The Wing) lounge reception can look up your flight itinerary via your onward boarding pass to verify that you arrived in first class and grant you lounge access. 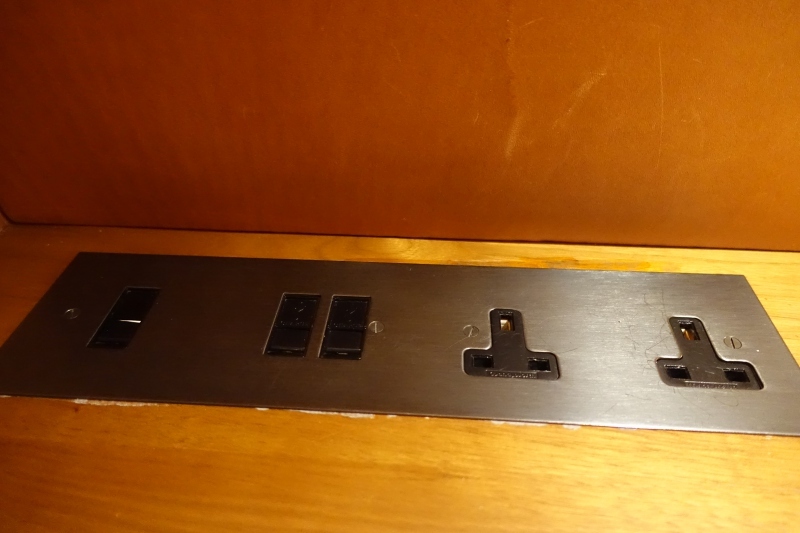 Note that the power outlets are for Hong Kong plugs, so you'll need an adapter. 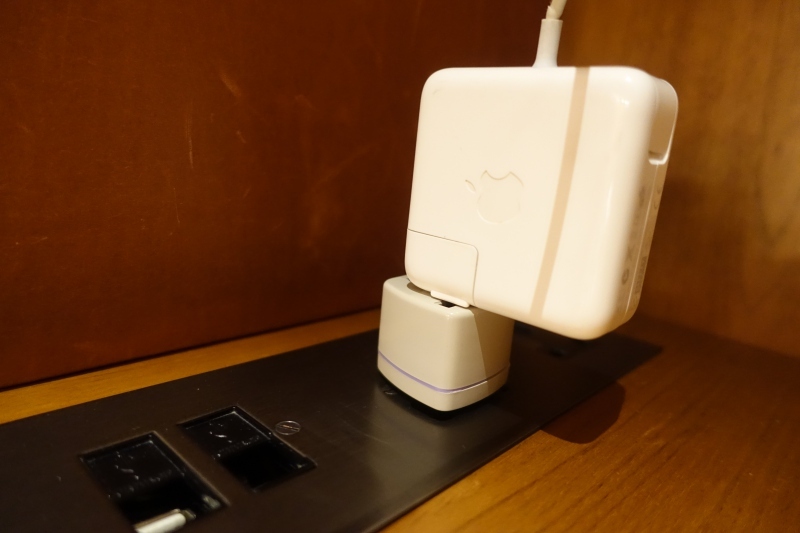 I'd forgetten to bring my universal adapter with me, but fortunately The Pier lounge reception had a power adapter I was able to borrow. 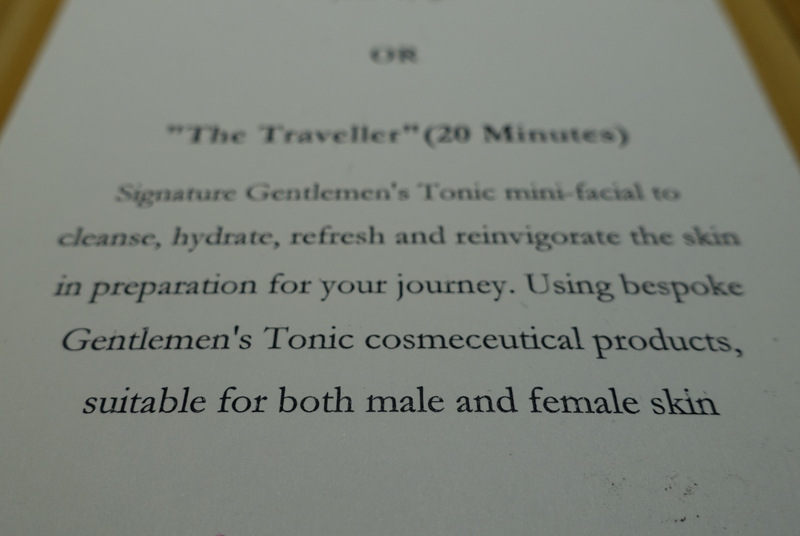 The highlight of the lounge, for me at least, is The Retreat Spa. 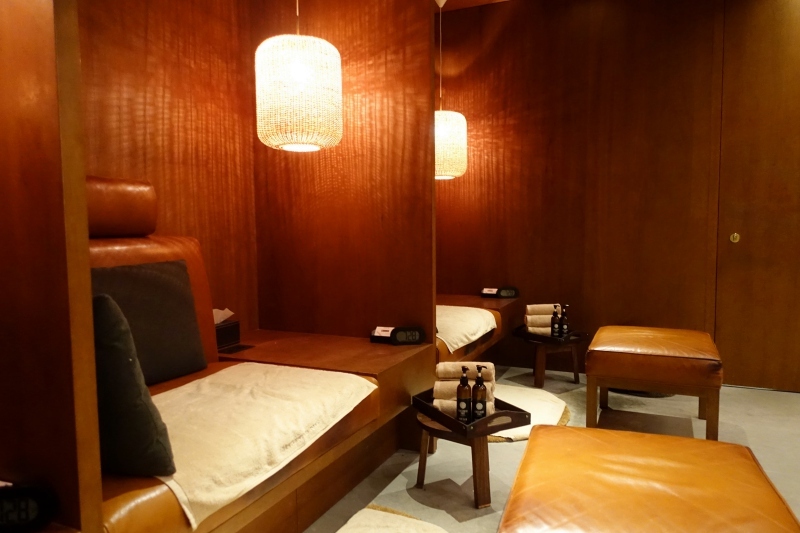 If you're hoping to have a complimentary massage, make The Retreat Spa reception your first stop, since there will likely be a waiting list. 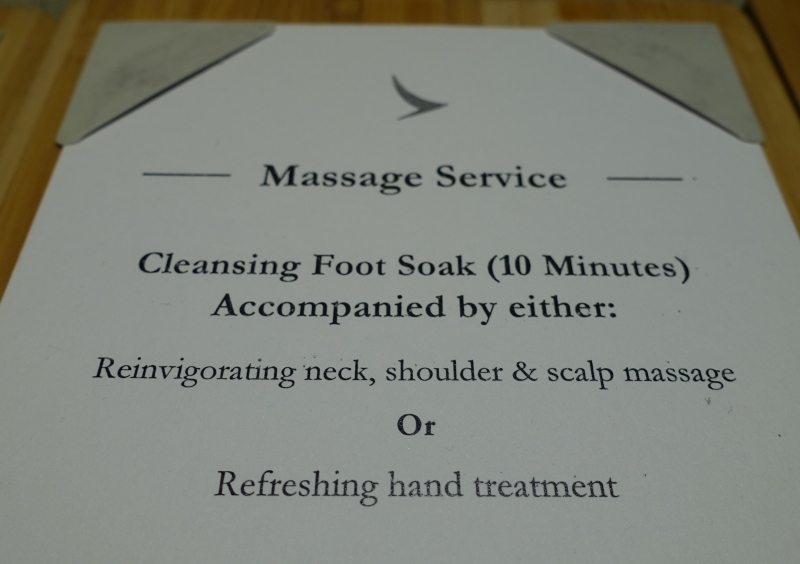 You have the option of a 10 minute foot soak followed by a 10 minute massage, or a 20 minute massage. On both my visits to The Pier, I chose the 20 minute shoulder and head massage. I had different therapists, the first time a woman, the second time a man, but both were excellent and really did great work with the knots in my shoulders. Highly recommended. 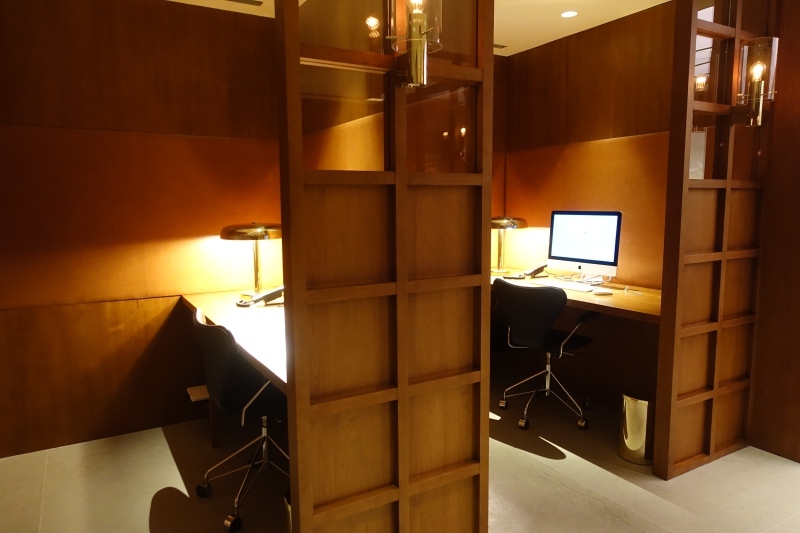 While a tip is not expected, therapists work hard and I recommend a gratuity if you're happy with your massage. 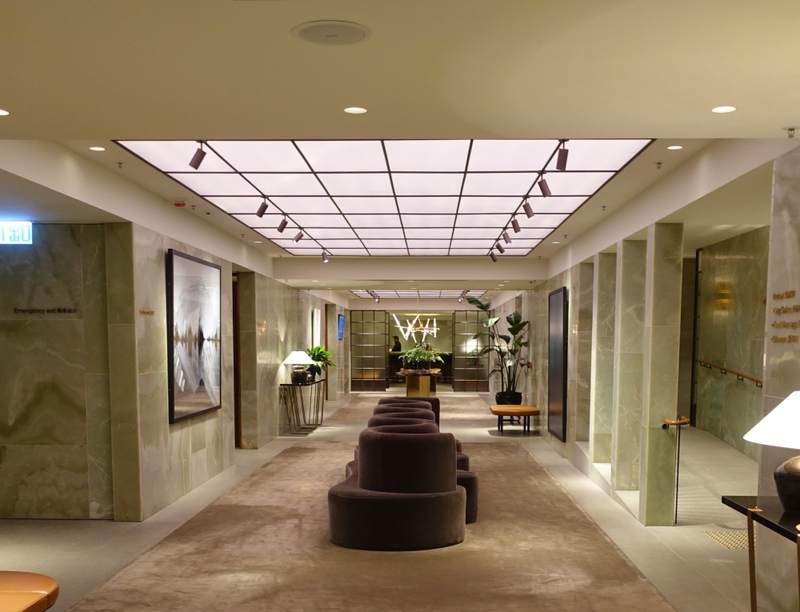 There are also shower rooms, but I didn't view those, as I opted for a bath in a cabana at The Wing First Class lounge. 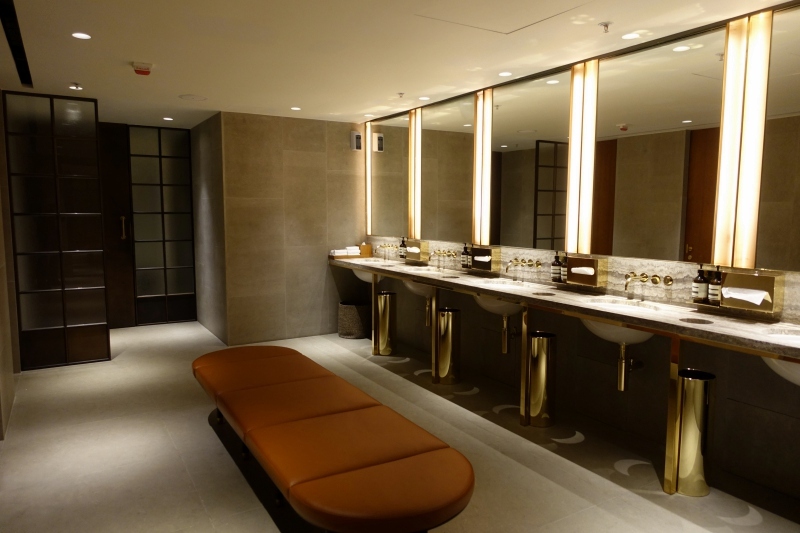 The women's bathroom was nice, and always completely empty when I visited, given the dearth of women passengers in the lounge. 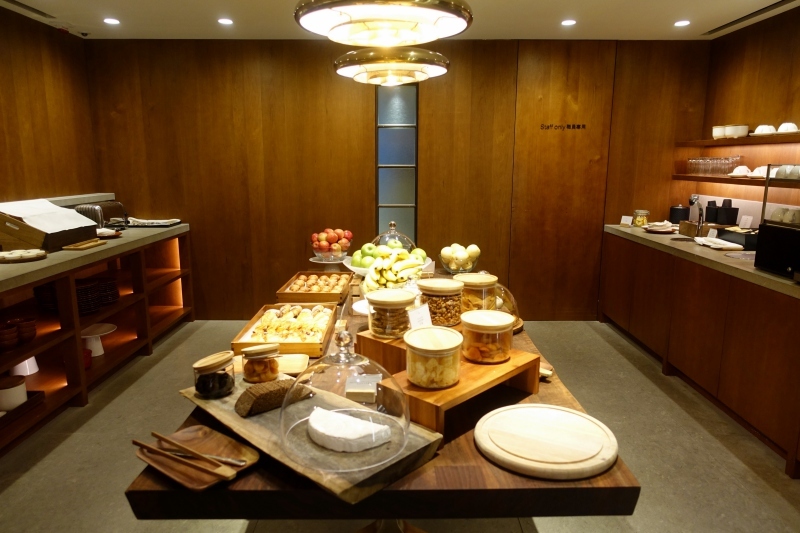 The self-service buffet is nicely presented, although I can't say I was tempted by any of the breads or pastries. I was happy to see d'arbo jam, however. More interesting are the chilled items, on the right hand side of the refrigerater that holds drinks. 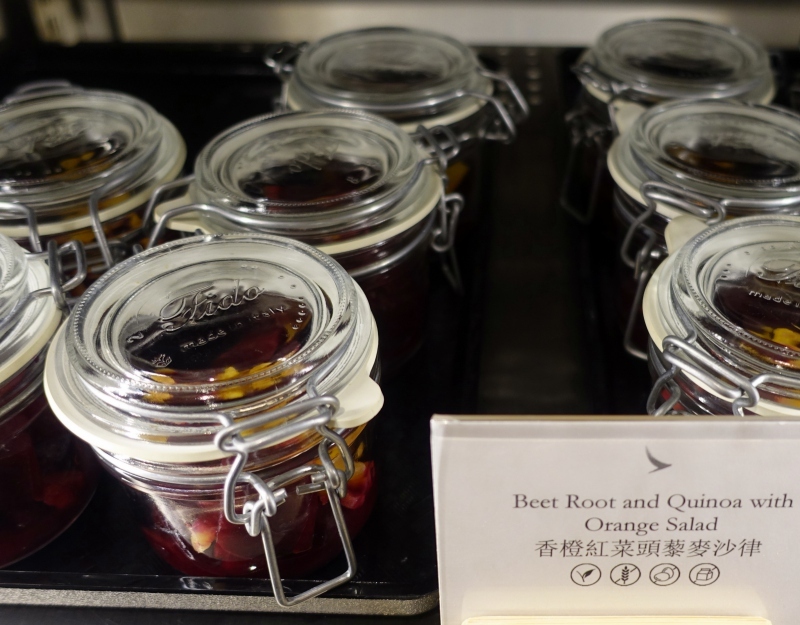 If you want something healthy, the beet root quinoa orange salad looked promising. 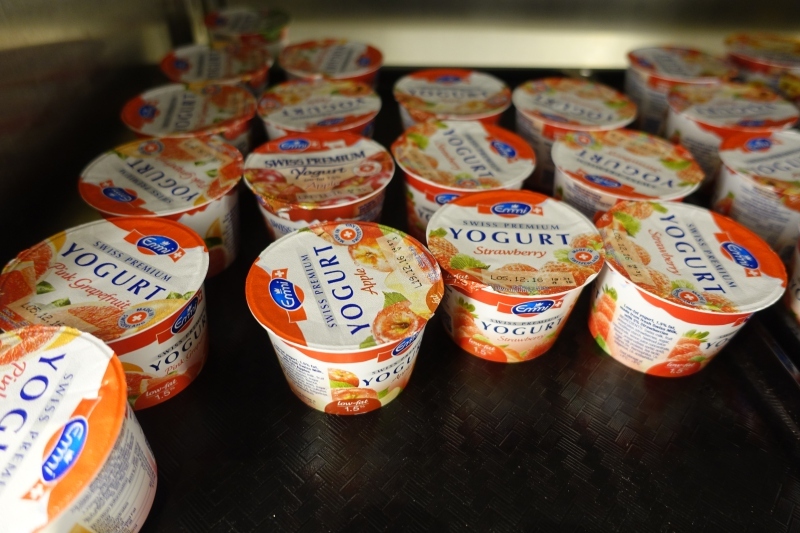 I also noticed Emmi yogurt–much better than the Dannon yogurt on my LAX-HKG flight. Unfortunately there were no fresh squeezed juices. 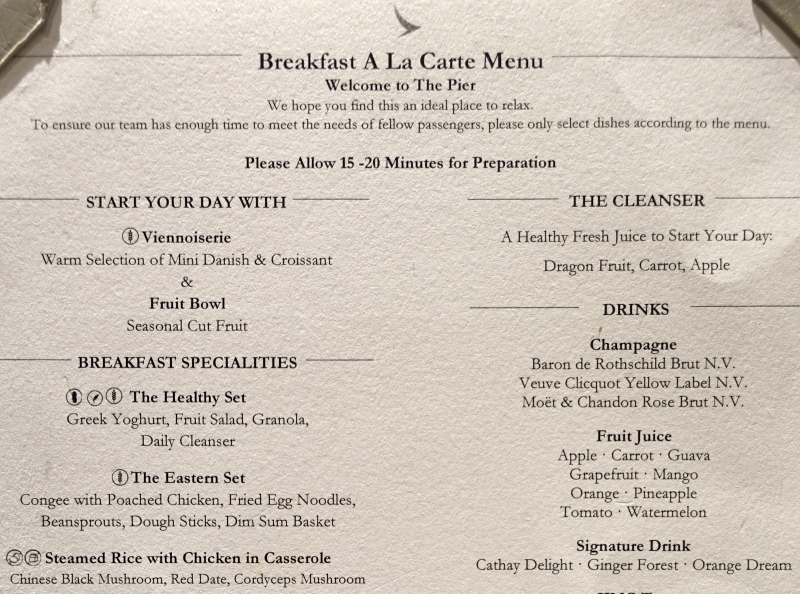 I do think that airlines' first class cabins and lounges really should make an effort to offer fresh squeezed juice of some kind, at least fresh squeezed orange juice. 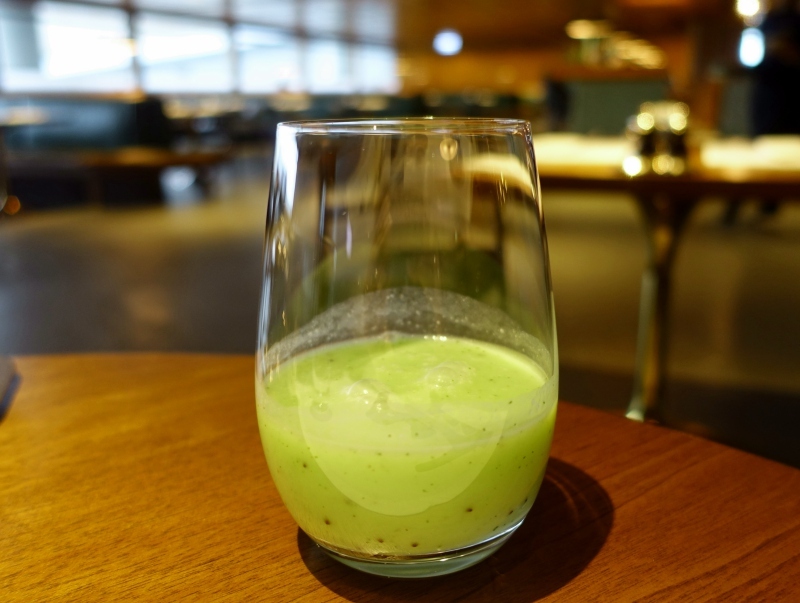 The server instead suggested the juice of the day, which she said was kiwi, coconut and lime. It was quite good, although I would have preferred fresh squeezed orange juice. 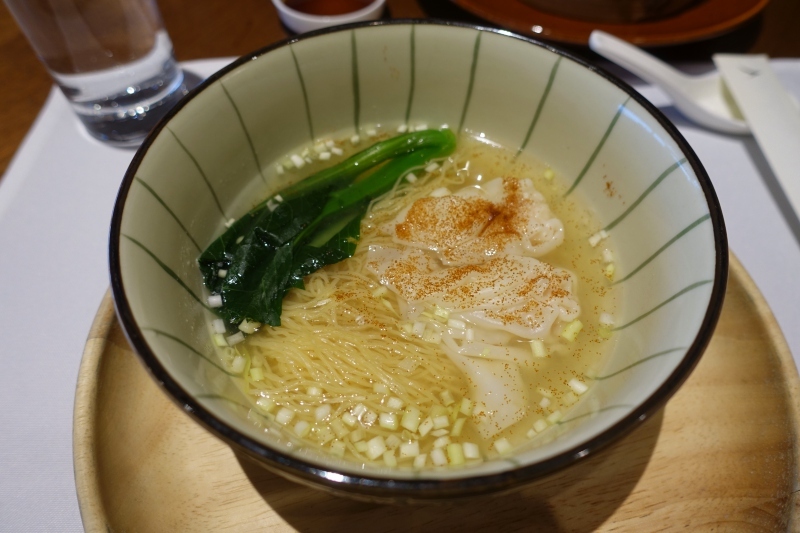 I liked the won ton soup, especially the won ton dumplings, although I would have preferred more won ton dumplings and no noodles. 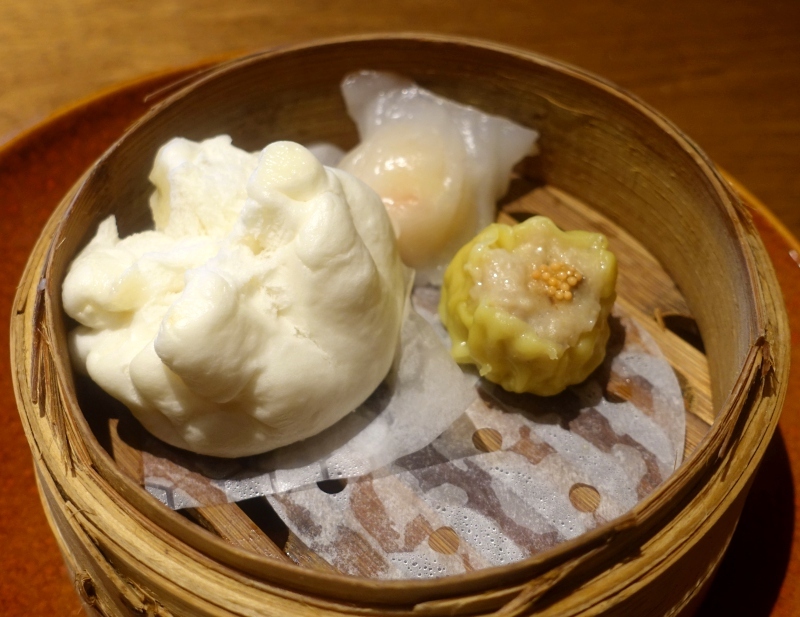 The dim sum, however, were quite mediocre–honestly, the dim sum on board the flight were better. 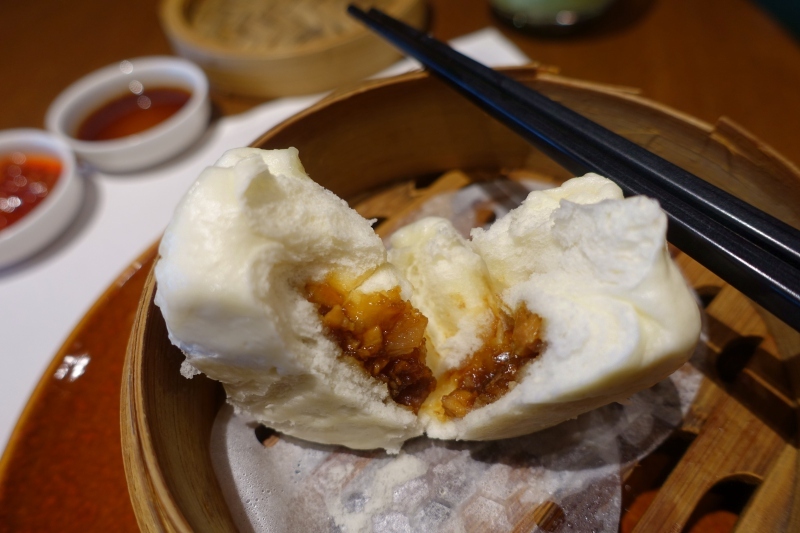 The char siu bao in particular was disappointing, with far too little filling compared to the steamed bun. 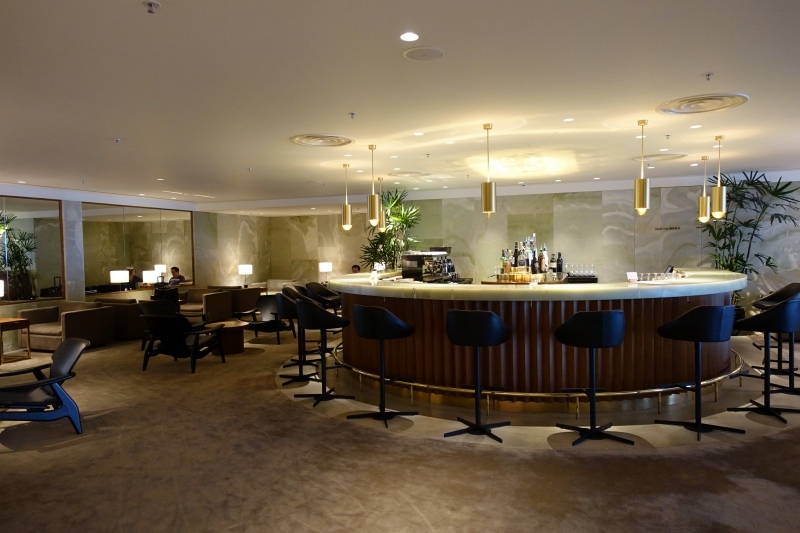 Cathay Pacific's The Pier First Class Lounge is beautiful and really shines when it comes to the complimentary 20 minute massage–just make sure you allow enough time before your flight or between connecting flights, as there's often a wait. 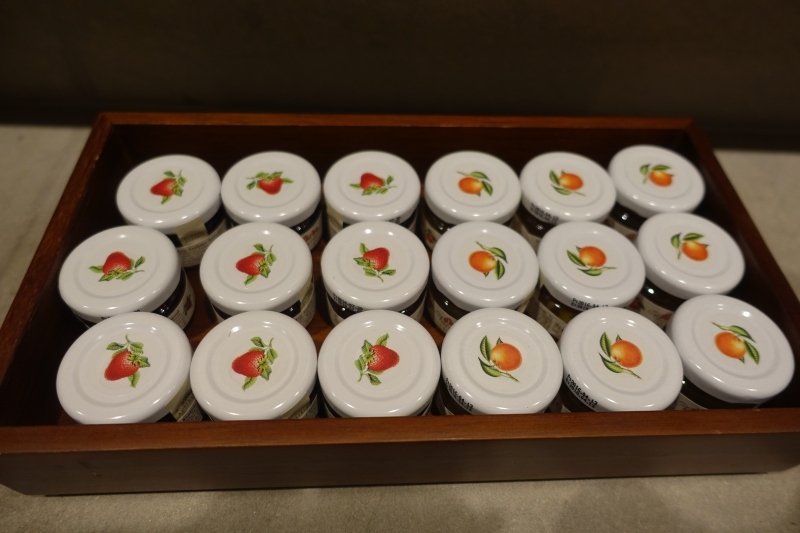 The food, however, as with the food in Cathay Pacific First Class, is quite average, at least the items I tried. 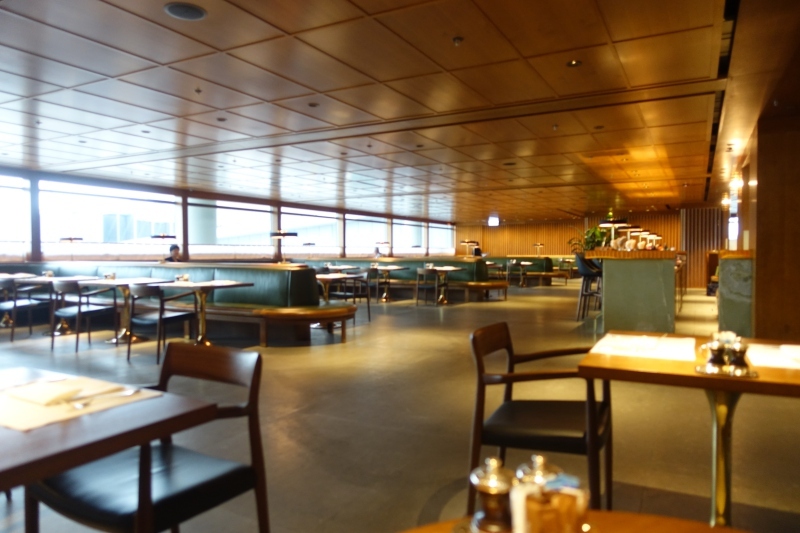 There was plenty of seating during my morning visits, both in the lounge areas and the dining room. 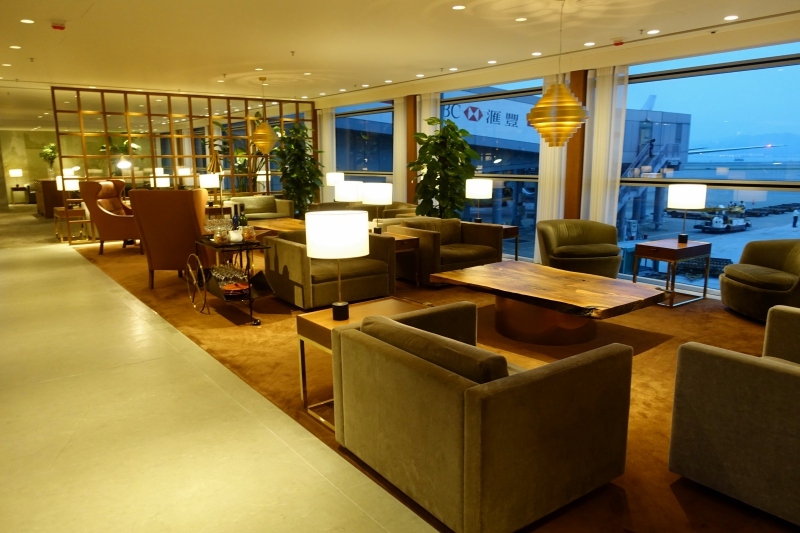 If you've recently visited Cathay Pacific's The Pier First Class Lounge in Hong Kong, what was your experience?